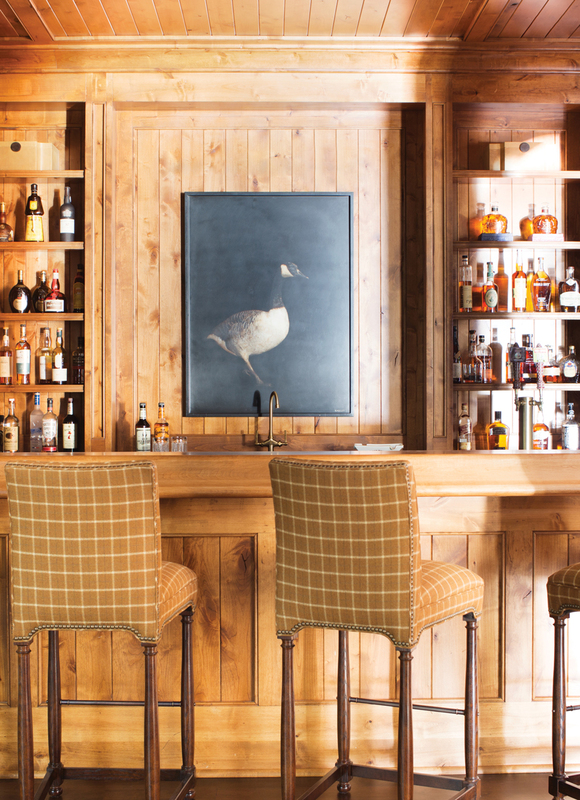 This home bar in Sandy Springs combines old-school tradition—rich wood paneling, cozy stools—with modern amenities. Features include a television, a built-in kegerator, and (of course) plenty of spirits. “There’s even a secret door behind the bar that leads to a hidden golf simulator and media room,” says interior designer Karen Ferguson of Harrison Design Associates. An edgier take on old-fashioned animal prints, this painting by Dawne Raulet stands out thanks to its black frame and mostly dark canvas. The Hickory Chair barstools are covered in a windowpane-checked fabric by Holland & Sherry that complements the alder. The antique brass nail heads on the stools reflect the plumbing and light fixtures. The built-in kegerator keeps brews cold and fizzy for an exte­nded period of time.